NEW BRITAIN — Francis Cole had to be consoled as he left the field and went into the Central Connecticut State football team’s locker room. His face red. It was just minutes before when Cole, hunched over on the turf, and the rest of the Blue Devils’ sideline watched Sacred Heart run onto the field to celebrate with five seconds left. Set up from the left hash, Cole missed a 44-yard field goal attempt that would have sent the Saturday’s game into overtime. Instead, CCSU fell to the Pioneers 28-25 at Arute Field, ending its eight-game NEC win streak and handing over first place in the conference to Sacred Heart (4-3, 2-0). The distance was well within Cole’s range. The junior kicker hit a 50-yarder earlier this season. The ball just went wide left. Cole finished his day making one of his three attempts. He hit a 43-yarder in the first quarter and had a 23-yarder blocked. In all, the missed kick capped off an up-and-down afternoon for CCSU (4-4, 2-1). The Blue Devils managed to score just eight points and collect 189 yards of total offense in the second half. CCSU’s lone touchdown of the final 30 minutes came with 5:25 left in the game when Jacob Dolegala connected with tight end Arthur Gilmore for both the 15-yard touchdown pass and the 2-point conversion. Dolegala finished the afternoon with 251 yards through the air on 22-of-34 passing. The Blue Devils began that final drive on their own 17-yard line with 2:36 left to play after the defense forced the Pioneers to punt. CCSU used 13 plays to go 70 yards, but only two plays went for more than 10 — both to running back Drew Jean-Guillaume on swing passes out of the backfield. Jean-Guillaume remained one of the few bright spots for the Blue Devils. He produced his third consecutive 100-yard game, running for 142 yards on 20 carries, while catching six passes for another 40 yards. Jean-Guillaume’s 70-yard touchdown run in the second quarter gave CCSU a 17-7 halftime lead. As much as the offense stalled throughout the second half, the defense didn’t have many answers for the Pioneers or their starting quarterback Kevin Duke, who completed 14-of-15 passes for 242 yards and two touchdowns after halftime. 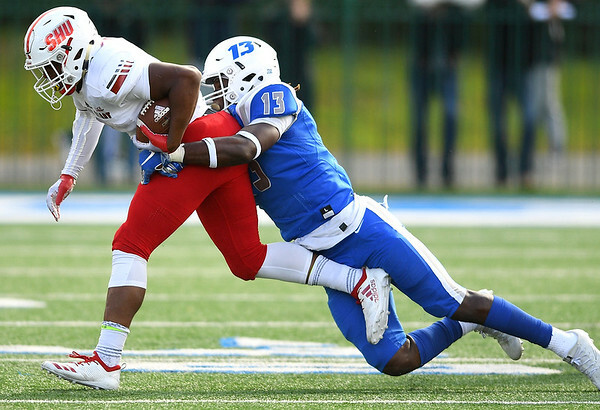 Duke, who missed Sacred Heart’s 42-0 loss to Dartmouth last week with a shoulder injury, led the Pioneers on three consecutive touchdown drives spanning over the third and fourth quarters. Duke hit Ed Cuddahy on a 7-yard touchdown pass with 11:55 left in the third. He then ran one in from three yards out with 56 seconds to go in the quarter. His final touchdown pass of the day came on 21-yarder to Andrew O’Neill with nine minutes remaining in the game. That pass proved to be game winner. O’Neill caught 10 passes for 170 yards and two touchdowns. Duke completed 21-of-28 passes for 374 yards. CCSU will return home next week as it hosts Wagner (2-5, 1-1) in another NEC matchup. Posted in Newington Town Crier, CCSU on Saturday, 20 October 2018 19:28. Updated: Saturday, 20 October 2018 22:00.